It was Winter when she left. Not a crisp and hopeful Winter, full of sparkling promise as it had been the previous day. No, this was a Winter day of dwindling light and remorseless rain, streaking the windows and bouncing off the pavements. Colours were insipid, light, muted – as if the day were muffled. Yesterday was a Spring day, apparently. The calendar says that Summer is nearly here and everywhere there are splashes of colour, like guests arriving dressed for a party which has not yet begun. Yesterday I visited a special place, my little bit of there which is here. The rain drummed on my coat and the grass squelched beneath my feet. Right there though, above the spot where she will be forever remembered, her cherry tree was flowering. Some of the bigger flowers had been felled by the rain, unable to resist the onslaught. 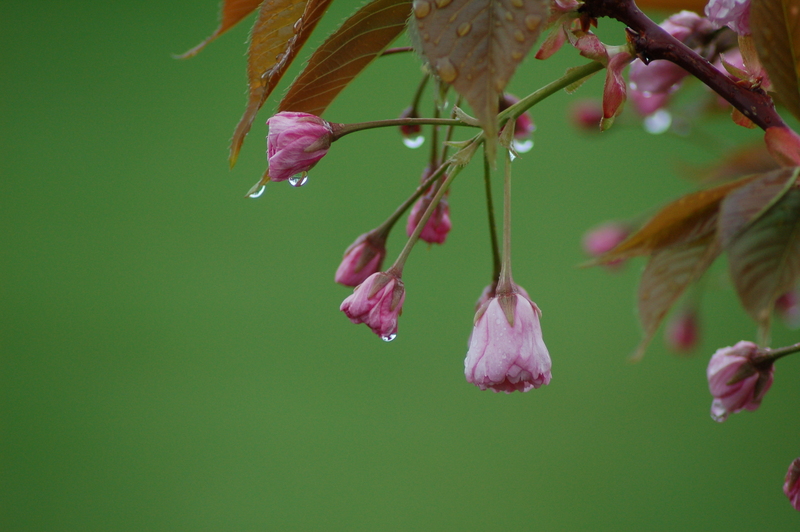 Some of the newer, tighter buds were holding on, the droplets of water making jewellery out of them. Showing fragile beauty in the storm and insisting on colour in the drabness seems such a fitting memorial for the bravest and best. Spring is coming. Martin Luther wrote that “our Lord has written the promise of resurrection not in books [the Bible] alone, but in every leaf of spring time” and so your tree will always hold this promise. I hope that you are as well as you could be.